Annus Abrar eid dresses 2015 have launched just now. The collection includes dresses which are fully adorned with modernity and high ends. The dresses are looking attractive and stylish in their designs. Annus Abrar has embellished these all dresses with embroidery, cuts and motifs. The dresses are perfect for young and modern girls. These Annus Abrar eid dresses 2015 are fully designed in simple pattern. All are ready made and available in stores now. Let’s check out these dresses here below. Annus Abrar is one in the most leading and famous fashion designers. Annus Abrar has been working in this field since 2012. The designer offers casual wear to formal wear dresses for women. Recently, Annus Abrar eid dresses 2015 have released. 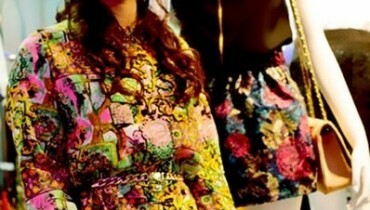 The collection includes dresses dresses which are fully embellished with embroidery and prints both. The dresses are really very stylish and stunning. Annus Abrar has designed these all dresses with modern looks. The dresses are embellished with embroidery, bead work, stone work and many more. The colorful and attractive dresses are perfect for young and mature women. These Annus Abrar eid dresses 2015 are perfect for eid but you can also make a choice of these dresses for parties and formal occasions. These dresses are colorful and neutral shades are used to design them such as pink, blue, grey, peach, ferozi, green and many more. All the shirts are in knee-length size with straight pants. You will find the silk and chiffon fabrics in this collection while the pants are in lace fabric. So, girls!! if you are modern and want to enhance your beauty on eid day then must check out the collection below. Annus Abrar eid dresses 2015 are stylish and stunning. Let’s check out them below and for further queries you can visit their Facebook page below.